HIS COMING SUNDAY, Fr. Gerard Saguto, District Superior of the Priestly Fraternity of Saint Peter (FSSP), will offer the 7:00pm Mass at Saint Victor Church in Hollywood. It will be a SOLEMN HIGH MASS with sacred polyphony and Gregorian chant—a fabulous opportunity to invite friends who have never experienced the Latin Mass. (1) Is the Traditional Mass disobedient? In 1988, Pope St. John Paul II founded the FSSP. Our name was chosen by Josef Cardinal Ratzinger, to remind everyone we are fully in union with Rome. Indeed, starting in 2007 every priest has the right to offer the Traditional Latin Mass, and bishops can no longer forbid this. (2) How different is it from the Ordinary Form? For example, both forms refer to this coming Sunday (23 April) as “Quasimodo Sunday.” But very few people attending the Ordinary Form even realize that, for reasons explained by Fr. David Friel. (3) Are my kids welcome? I’ve never met an FSSP priest who doesn’t love children; they are particularly welcoming to large families. Sometimes priests will say “children making noise at church doesn’t bother me”—only to discover later on they weren’t telling the truth. But our FSSP priests aren’t like that; they view kids as our Church’s future. Our evening Mass is quieter than a morning Mass, mainly because Saint Victor has the greatest cry room in the world. It’s next to the Altar, behind glass. Check out our cry room view. (4) What if I don’t know how to participate? 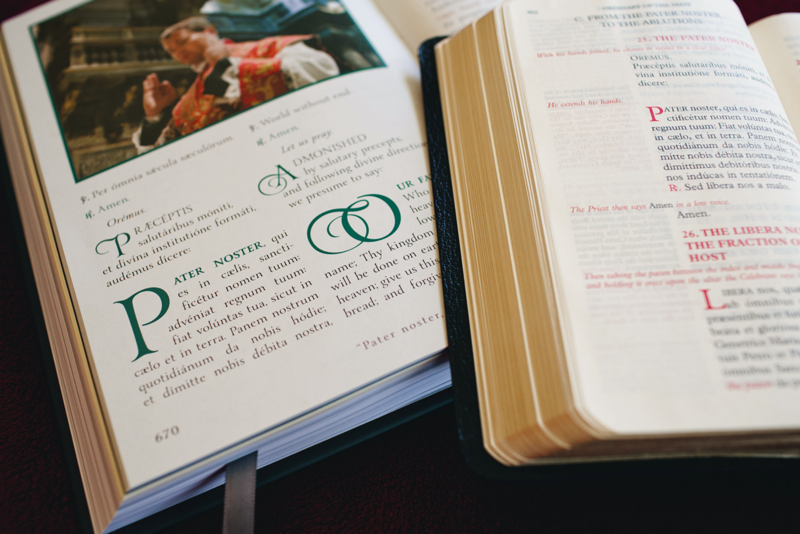 Saint Victor has special hymnals—enough for everyone who comes—containing the complete Mass texts in English and Latin, alongside color pictures. That’s the best way, because some older books can be confusing. Please read this recent testimony from a mother at Saint Victor and consider whether there’s any reason to be nervous. (5) Will I enjoy it? When we first attended the Traditional Latin Mass, my brothers hated it—and so did I. But our mother kept forcing us to attend, and with the passage of time we came to love it deeply. I clearly remember one thing about that first time: the priest always kept his head down, with his eyes humbly focused on prayer and nothing else—as if he were a slave. That’s how all the FSSP priests offer Mass, because the rubrics control everything the priest does: bowing, arm placement, genuflection, when to kiss the Altar, even what to look at and when. (6) Is the entire Mass silent? It depends. Low Masses are usually extremely quiet, but High Masses—if done correctly—contain almost no silence, in spite of a common myth repeated by people who lack familiarity with the traditional liturgy. (7) Aren’t the Latin Mass people weird and grumpy? Those of us who started attending the Traditional Mass in the 1990s did come across some strange people who seemed perpetually angry—but that was twenty years ago! Most of that has faded away. The people I meet at traditional communities are friendly, smart, brave, honest, and holy. The reputation of “grumpy traddies” is a myth, stemming from so-called “ultra-traditionalist” websites run by angry individuals who don’t accurately represent the traditionalist movement. The worst examples are by cowards who publish under false names, usually to conceal their credentials. The reason the “good guys” don’t have an equal online presence is simple: they’re too busy saving souls to spend all day typing on the computer. For example, the FSSP priests are not allowed to be on Facebook. (8) Will people stare at me and judge me? The only reason people would stare is if you’re dressed immodestly. Those who attend the Traditional Mass tend to leave one another in peace during Mass. They are not “in your face”—because everyone is too busy adoring the Lord. (9) Isn’t this all about recreating some former time period? No, the Traditional Latin Mass is not about museum pieces. At the same time we must be wary of discarding anything that’s ancient, because then we’d have to throw out the Bible! Some things can never go out of style: truth, holiness, philosophy, beauty, love, and so forth. Moreover, the rites, prayers, and songs of the Extraordinary Form go back verbatim to the 5th century—or even further back than that (but this is hard to know, because we have very little documentation). We should be careful before we eliminate traditions so ancient. So, what are you waiting for? I hope to see you Sunday evening in West Hollywood! 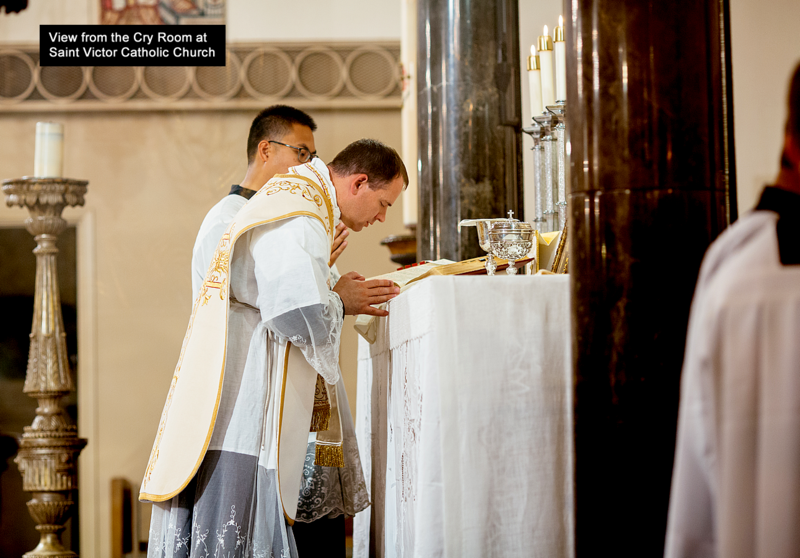 To learn more about our brand new Latin Mass Apostolate in Los Angeles, you can start by perusing the bulletin archive. Many changes made in 1970 were not in accordance with what the Council actually wanted. Indeed, the two things most associated with Vatican II—Mass “facing the people” and elimination of Latin—were done in opposition to what the Council mandated. Consider the musical situation. The ancient propers in the Ordinary Form are taken from the same book as the Traditional Latin Mass. (To see this, download the Vatican II “Ordo Cantus Missae.”) But a loophole was added in 1970 which says hymns can substitute for the official texts. The substitute hymns are supposed to be approved by the local bishop, but a USCCB committee made matters worse by saying certain parts of the GIRM can be ignored. The result is that 95% of parishes replace all the propers, without even realizing what’s happening. I know several music directors who literally “roll the dice” each Sunday to choose four hymns—and who can blame them?—because constantly replacing the official texts becomes tedious. Secular styles were also introduced during the 1970s, and I believe this was the primary reason for the improbable triumph of the Latin Mass. These days, it has become fashionable to pretend all styles of music are appropriate for Mass: jazz, rock, polka, and so forth. But even a small child realizes that the inherent qualities of some musical styles (for example, the “Addams Family Theme Song”) are not sacred.